Now add sliced onion and fry till golden brown. Add beans, carrot, peas and tomato. Mix well and add cumin powder, coriander powder, chili powder and haldi. Mix and cook till veggies are soft and cooked completely. Add chopped cilantro and let it cool. Now cut puff pastries as round shape, using any mould or lid. Top a spoon full of veggie mix on top of puff pastry sheet. Fold triangularly, giving it a shape of samosa. 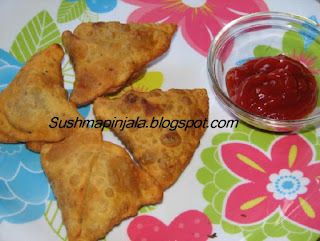 Bake these samosas in preheated oven on 350 degrees F, for 10 to 13 minutes. Dry roast coconut and poppy seeds separately. Add chopped almonds, cashew, raisins, tooty fruity and sugar to coconut mix. Add salt and melted butter to maida and mix well. Add little water at a time and mix well. Make a stiff dough and rest it aside for 15 minutes. Roll each ball as small poori and cut into half. 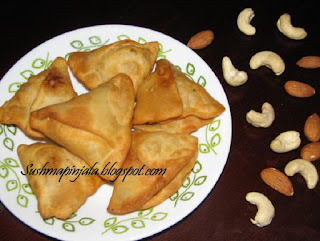 Fold it as triangle and fill with the dry fruit mix. Cover all the sides tightly so that the mix does not come out while frying. Prepare all the samosas and keep aside. I have taken the chicken pieces and very little gravy from Chicken fry. Make chicken pieces into small pieces. Add salt, ajwai and melted butter to maida and mix well for 5 minutes. Cut chicken into medium or small pieces as you like and wash them. Add haldi, ginger garlic paste, chili powder and salt to chicken and marinate for 1 hour. In a pressure cooker add 2sps oil and add the marinated chicken. Saute for few minutes and add 1/4 cup water. Mix well and pressure cook till done. In another pan heat rest of the oil and add whole garam masala. Saute and add sliced onions, curryleaves and green chilies. Now add cooked chicken with water if any and mix well. Add garam masala and cook further till the chicken turns to slight brown color. Please make sure this process is done on medium flame. 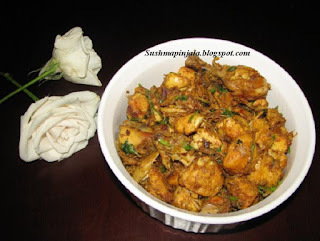 Simple and delicious chicken fry is ready to serve. We need to take very ripe mangoes. Peel of skin and mash them to smooth paste. Heat water and add 10sps of gelatine and mix well. Add sugar to the gelatin mixture. 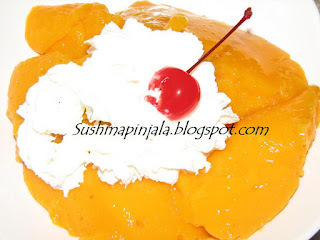 Now add the whipped cream to the mango pulp and keep aside. When the gelatin mix is cooled and all the sugar is dissolved add this to the mango pulp and mix well. Now Beat the egg whites stiff and fold it to the mango mixture. Transfer this to the serving tray or any other container and let it set in freezer for 2 hrs. We know that Mango is a seasonal fruit. Recently came to know that few of my friends store these raw mango pieces. To use these mangoes in other seasons, simply wash the raw mangoes and cut them to medium pieces. Dry them in sun till they become hard or crisp. Store in air tight container and use it for rest of the year. Today's recipes is sweet and tangy mango curry. Sweetness come from jaggery and tanginess come from mango and tamrind juice. Wash the mango and make them into medium pieces. Now add mustsrd seeds, chana dal, curry leaves, fenugreek seeds, cumin seeds, red chili and slit green chili. Now add chopped onions and saute till golden brown. Today we are starting with 2nd week of BM 28. My theme for the week is recipes with Mango. Summer, first thing which comes to my mind is mangoes. Mango is the national fruit of India. Mangoes are widely used in cuisine. 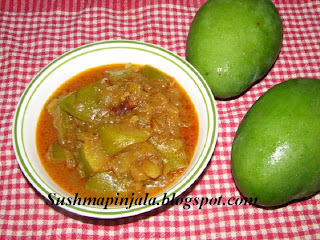 Sour, unripe mangoes are used in chutneys , pickles or side dishes, or may be eaten raw with salt and chili powder. A cooling summer drink called panna comes from raw mangoes. Mango pulp made into jelly or cooked with red gram dal and green chillies may be served with cooked rice. Ripe mangoes are also used to make curries. The pulp from ripe mangoes is also used to make jam . Andhra Aavakaya pachadi is a very famous pickle made from raw, unripe, pulpy and sour mango, mixed with chilli powder, fenugreek seeds, mustard powder, salt and ground nut oil. 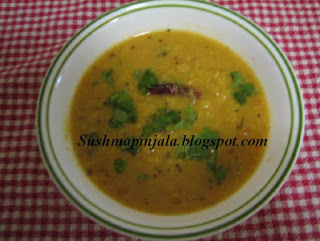 Mango is also used in Andhra to make Dal or pappu. 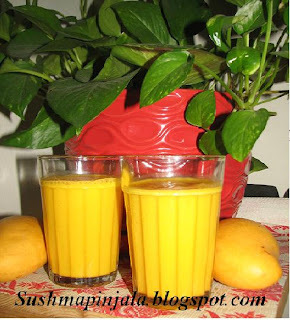 Starting this weeks 1st post with Mango lassi, a popular drink is made through out India, adding butter milk and suger to ripe mango pulp or ripe mangoes. Add salt, black pepper to wheat flour. Now add water little at a time to make a dough. Knead it into soft dough and set it aside for 5 to 10 minutes. Now make this dough into equal portions. Roll each portion as chapati using oil or what flour. 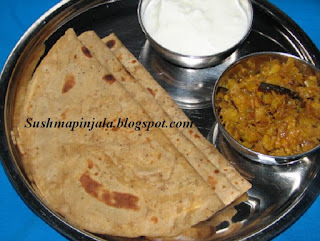 Heat tava and cook the chapati on medium flame using oil. Remove and serve hot with any curry or dal. Presser cook washed toor dal adding tomato, turmeric and green chili. Once done let it cool to mash the dal. Now name tempering in a medium sized pan. Add oil, once the oil is hot add mustard seeds, cumin seeds, red chili, curry leaves, hing, methi seeds and chopped ginger. Fry for a minute and add mashed dal and 1.4 cup water. Simmer and cook for few minutes. Remove and transfer to serving bowl. 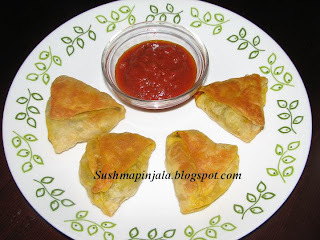 Its been a long time I have posted some recipe. Happy to be back with some delicious recipes and blogging marathon. Today we are starting BM#28. I choose to cook Sindhi recipes for next 3 day. Sindhi Cuisine refers to refers to the native cuisine of the Sindhi people from Sindh and Pakistan. The daily food in most Sindhi households consists of wheat based flat-bread and rice accompanied by two dishes, one gravy and one dry. 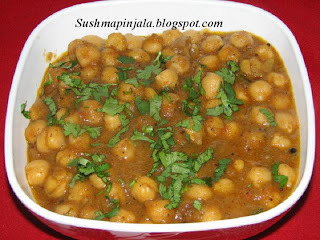 Today, Sindhi food is eaten in many countries including India,where a sizeable number of Sindhis migrated following the Partition of British India.